Neutrik Jacks (EN) | PRO MUSIC, s.r.o. Vertical PCB mount panel jacks in A-gauge and B-gauge versions with gold plated contacts and unique quick fixing cap for rapid panel mounting. Separation of mechanical latch and electrical contacts offers high retention force combined with low insertion force. Smallest XLR / jack hybrid panel mount connector combining a 3 pole XLR receptacle and stereo ¼" phone jack in one XLR housing. Space saving combination of 2 connectors in one plastic housing. Available with horizontal or vertical pcb mount. Many equipments have two input connectors (balanced XLR and unbalanced jack). But in almost all cases only one input is used at a time, so the Combo reduces panel space, costs and simplifies pcb design. First XLR / jack hybrid panel mount connector combining a 3 pole XLR receptacle and mono or stereo ¼" phone jack in one XLR housing. Space saving combination of 2 connectors in one plastic housing. Available in nonswitching and normalling versions with horizontal or vertical pcb mount or soldering termination. 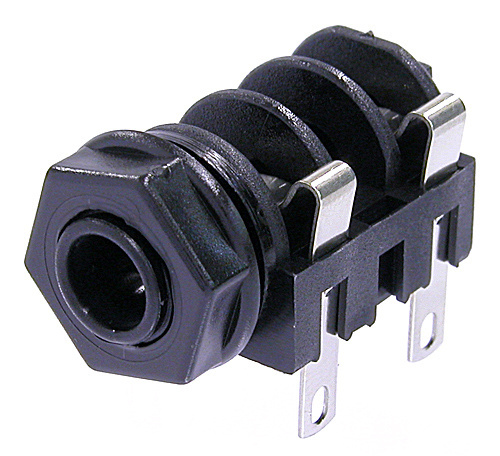 Many equipments have two input connectors (balanced XLR and unbalanced jack). But in almost all cases only one input is used at a time, so the Combo reduces panel space, costs and simplifies pcb design.